For much of her life, Anne Morrow, the shy daughter of the U.S. ambassador to Mexico, has stood in the shadows of those around her, including her millionaire father and vibrant older sister, who often steals the spotlight. Then Anne, a college senior with hidden literary aspirations, travels to Mexico City to spend Christmas with her family. There she meets Colonel Charles Lindbergh, fresh off his celebrated 1927 solo flight across the Atlantic. Enthralled by Charles's assurance and fame, Anne is certain the celebrated aviator has scarcely noticed her. But she is wrong. Charles sees in Anne a kindred spirit, a fellow adventurer, and her world will be changed forever... The fairy-tale life she once longed for will bring heartbreak and hardships, ultimately pushing her to reconcile her need for love and her desire for independence, and to embrace, at last, life's infinite possibilities for change and happiness. I love historical fiction, but I especially love historical fiction that's based on real people. I've never actually read anything by Melanie Benjamin, and I was excited for this to be my first. 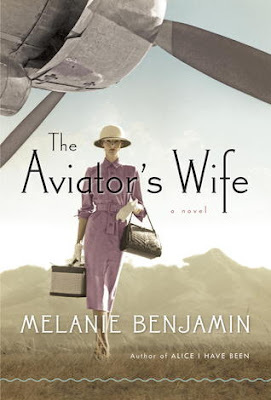 The blurb compares The Aviator's Wife to The Paris Wife, and I loved that book so I definitely expected good things going into this one. Not to mention my love for this cover - isn't it just so lovely?! I adore the chic outfit, traveling case and the tiny bit of the airplane hinting at what's inside. While I recognize Charles Lindbergh's name from his solo flight across the Atlantic, I honestly didn't know very much about his marriage to Anne Morrow. Narrated from Anne's perspective, the book allows you to see Charles and their relationship through her eyes. What I found so interesting about this book is that it's very much about Anne's personal growth. When you first meet her, she is the shy and overlooked diplomat's daughter. With one beautiful sister and one charming sister, she is merely the reliable one. The way she talks about herself and acts around others indicates that she has really low self-esteem, and those feelings end up playing a huge role in her interaction with Charles because their relationship seems to be largely based on her hero worship of him. It was a bit difficult to read about her fawning adoration of him based solely on his heroic flight and made it really hard to like her at first. I wanted to reach through the pages and shake her by the shoulders on more than one occasion! Her life is dominated by Charles - his opinions, his directions, his dreams - but it seems like that's a pretty accurate picture of their marriage relationship. So, I certainly don't fault the book for Anne's portrayal since it seems like these feelings and actions were very true of the real Anne Morrow Lindbergh early on in her marriage. It was hard to see Anne step back into the shadows around Charles, despite her own major achievements (like becoming the first licensed female glider pilot in the United States). After the birth of their firstborn, there's a pretty shocking event that completely shifts everything. If you know anything about the history of this family, you'll probably know what I'm referring to here. However, I actually didn't know that the Lindberghs were famous for more than just flight, so I won't spoil it in case you are in the dark like I was. That event marked a turning point in Anne's life and in the book. As a reader, you could see her attitude shifting and recognize her starting to show more agency. I became much more engrossed in the book after that point. Anne was so talented, and yet so blind to her own worth for so long! I have to commend Melanie for taking a problematic (and often unlikeable) character and actually making me care about her journey towards independence. One of my favorite things about reading this was that I was learning new things about a couple who spent most of their lives in the public eye. I love when historical fiction actually teaches me new things! One small example - I'd never heard the word aviatrix before. It's just a term for a woman who is an aviator, but I love that I was introduced to a new word! I really loved learning more about this famous couple, and it left me with an appetite for more! Melanie offers some suggestions at the end for further reading on Charles and Anne Lindbergh, and I loved that she included those recommendations. Despite finding Anne difficult to like at first, I ended up really enjoying this novel. It was an added bonus that I got to learn more about that time in our history and the Lindberghs' contribution to aviation! I'd definitely recommend this to fans of historical fiction or anyone interested in history or aviation. "And listening to him, I realized, with a thrill, that I did want to fly; to experience this holy thing, to soar above the earth as he had done. To be above all; to be above worry and fear and, yes, petty strife, but mainly, simply to be above myself - this awkward body, this mind full of doubt and heart full of longing." *I received a copy of this book from Random House in exchange for an honest review. I was not compensated in any way for my review. Oh! I've been wondering what you thought of this one. Love the cover, and it's right up my alley as far as historical fiction goes! I'm going to have to add this to my ever growing library list for sure. I also love historical fiction but I haven't been able to see any recently that's caught my eye. This sounds really interesting though! Perhaps this can help break my dry spell of no adult historical fiction. I don't know too much about Charles Lindbergh (and so even less about his wife), but this book sounds like it's full of interesting elements. Glad you were able to enjoy it! This sounds absolutely amazing! I'm a big fan of historical fiction, and this book interests me because it talks about something I haven't read too much about. So fascinating! Okay, this is a book that I had not seen or heard of yet but you are the best for introducing me to historical fiction since that is one of those genres that I tend to neglect. I agree, this is a great cover and I don't really know that much about this famous family (nor do I know the detail that you hinted at but didn't spoil!). I think this sounds like it would be a fun car audiobook by CD for me if my library will buy it - I might be bold enough to request it if they don't already plan to purchase it because I'm pretty sure that the folks around here tend to read books like these on CD. In fact, they probably will buy this one without me having to ask. Look at you! Expanding my literary horizons! HA! I love historical fiction, so you know I'm ecstatic to hear that I help introduce you to more books in that genre. YAY! I think that not knowing much about the family made this an even more interesting read because I didn't know anything about their story, how it ended, etc. And I loved, even more, that I was reading something based on real events! Yes, the conversations/emotions are fictionalized, but the events themselves did actually take place. So cool! I hope your library gets this on audibook! The author has written a few other well-known and popular historical fiction books (that I haven't read), but hopefully that makes it more likely that they'll get the audio of this one! Yay for learning new words haha!